The Residence is located in the heart of the "Sella Ronda". 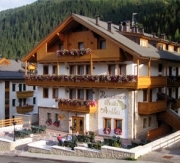 The Four Dolomite Passes Tour, called "Sella Ronda", circumnavigates the Sella massif, passing through the four Ladin valleys: the Val di Fassa, the Val Gardena, the Val Badia and the Fodom. It takes you about a day to complete the tour. The Sella Ronda ski tour can be done clockwise, following the orange signs , or anticlockwise, following the green signs. You can depart on your skis 50 meters from the Residence. It is one of the most beautiful ski routes in the world, a ski-safari with modern ski lifts, which you can also use during summer, admiring famous valleys such as the Fassa Valley, the Val Gardena, the Alta Badia and the Fodom. You will visit the following locations: Canazei, Selva Gardena, Colfosco, Corvara and Arabba di Livinallongo del Col di Lana. You will pass the four mythic passes of the Dolomites: the 2.239 m high Pordoi Pass, the 2.237 m high Sella Pass, the 2.212 m high Gardena Pass and the 1.875 m high Campolongo Pass. There are a vast collection of other activities on offer such as rock climbing, ice climbing, paraponting, mountain biking, mushroom hunting and sampling the fabulous food and wine on offer in the many mountain restaurants. Residence Baita Antlia is staffed by friendly, helpful, multi lingual, local personnel who have an intimate knowledge of the area and the opportunities available to guests. There are four different types of apartments: - one-room accommodation (STUDIO) with a sofa bed in the living room and 1 bathroom for 2 people - two-room accommodation (BILO4) with 1 bedroom, a livng room with double sofa bed and 1 bathroom - two-room accommodation (BILO5) with 1 bedroom and 1 sofa bed, a livng room with double sofa bed and 1 bathroom - three-room accommodation (TRILO 6/7) with 2 bedrooms and 1 sofa bed, a livng room with double sofa bed and 1 bathroom. In every apartment there are the following services: kitchen with refrigerator - dishwasher – microwave oven – satellite TV– telephone - bathroom with shower or spa bath. All apartments include the use of towels, sheets and pillow cases and bathrobes. Wireless internet access is available in the bar area. Breakfast is available at an additional charge. There is a bar which is open throughout the day until 9.00 pm where you can puchase beverages. Undercover secure garaging is available, free to all guests. There is a ski room, equipped with boot warmers. RELAXATION ZONE After a ski or excursion day you can relax in the hotel's relaxation zone with swimming pool, sauna, steam room, plunge pool and showers. There are towels available but guests are advised to bring their swimming costumes and suitable footwear. There are tanning facilities at an additional charge.